Our MFA program also offers 6 different certificates for students who are interested in broadening their scope of expertise to satisfy their own intellectual curiosity as well as make themselves more marketable. The certificate program has a rolling start date. Once approved, certificate candidates may begin taking courses in any term in which they are offered as long as they meet the requirements for the individual course. Personal Statement, (2) double-spaced typewritten pages. Describe your background and current interests in the certificate you are choosing. This certificate is based upon the completion of four areas that will prepare the student to be a competent dance practitioner equipped with excellent writing, research and pedagogical skills. The student will embark in the scholarly study of dance having the philosophy of Phenomenology as the foundational principle to study the dancing body and the history of dance performance; will go into the analysis of dance following the academic perspective of Performance Studies; and will examine dance as a social justice practice through choreography, performance and critical pedagogy. All these approaches are integrated so the student can explore her/his own critical thinking processes that will lead her/him to create her/his contemporary dance practice based on the unity of theory and practice. Writing sample required with application materials. This certificate is offered to the Design and Production students as well as students with a Bachelor’s degree who are pursuing a teaching career. The certificate is also designed to enhance the professional development of the dance educator. The student will take two courses in Choreography, will present her/his own choreographic work in two MFA dance concerts, and will study Laban Movement Analysis as a tool to understand movement potential and have numerous resources for movement exploration processes. The student will gain confidence in her/his voice as a choreographer and the identity of her/his artistic work. Choreography audition and committee interview required. 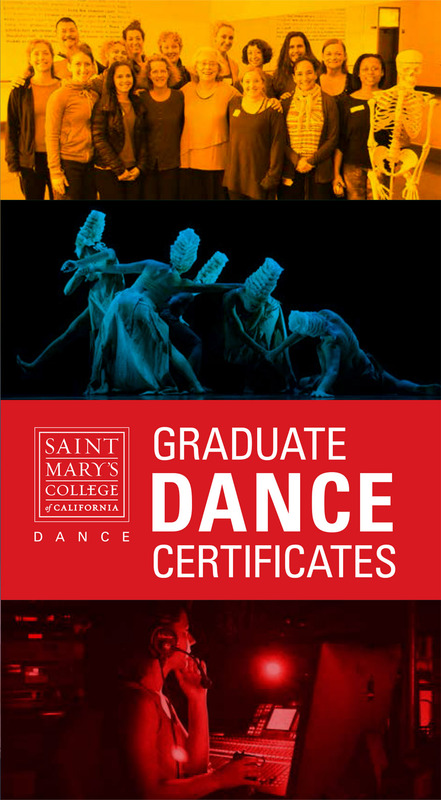 This certificate is offered to MFA: Design and Production students as well as students who fulfill the prerequisites to enter the MFA in Dance program and who are interested in studying contemporary approaches to dance education based on the integration of Critical Pedagogy and the field of Somatic Movement Studies. Besides the courses on Pedagogy and Somatic Movement Studies, the student will explore one or more somatic movement systems as well as experience the practice of teaching. This certificate will benefit the dance artist who already teaches and wants to explore the somatic based pedagogical practice or those dance artists who are ready to investigate the somatic movement practice and start their teaching career. The certificate in Somatic Movement Studies and Dance Pedagogy will enhance the professional development of the dance educator. Teaching audition required. This certificate is designed for dancers or Creative Practice students wishing to either start their own company or work in education after graduating. The ability to design lighting, scenery and costumes allows students with this certificate a well-rounded perspective on design for dance as a whole. Portfolio required with application materials. This certificate is designed for students who wish to pursue lighting design in addition to their existing educational pursuits. As with the Design for Dance certificate, this would allow a student the ability to design for their own work or the work of others. lighting who wishes to specialize in lighting design for dance. Portfolio required with application materials. This certificate is designed for creative practice students who wish to start their own company, dance studio, or run an academic program. The management focus provides students with a production background that allows them to run a dance company or handle the production management aspects of running a small dance program. As with the design certificate this certificate might appeal to a stage or production manager for theatre who wishes to increase their specialization in the area of dance. Portfolio required with application materials.